You Are Here: Home → Airbrush or traditional makeup? Review of: Airbrush or traditional makeup? A brief introduction into traditional and airbrush makeup is presented along with pros and cons. This is the TO BE or NOT TO BE in the world of makeup. A hard decision that must be made: using traditional makeup or going for the airbrush makeup option? This article will introduce Traditional makeup and Airbrush makeup and their pros and cons. If you don’t have enough information and facts, you will now. This will make your decision-making process much easier and quicker. So, let’s begin! Traditional makeup has been used for centuries by women all over the world. It is the “old school” method used for your beauty routine. Traditional makeup represents any cream, liquid and pressed powder or foundation that is applied to your face by fiber brushes, sponges and foundation brushes. The variety of pigments is amazing as well as the levels of coverage available. It can be applied even with fingertips (in cases when you don’t have or don’t want to buy brushes and sponges). More versatile – it can be used in many different ways and has a wide range of pigments available. This is due to the fact that it has been used for many years. Easy to apply – No experience is needed to apply the makeup. You can do it yourself anytime anywhere. If you are a total beginner all you need is to buy the desired makeup and check out a YouTube tutorial on how to apply it. You can use brushes, sponges or your fingers. More economical – Traditional makeup is less expensive than airbrush makeup. This is because there are a lot of makeup companies and the competition is excessive. No special equipment – You are not required to buy any equipment or to go through a special training in order to apply your makeup. Better for pores, wrinkles and blemishes – Traditional makeup will sit better and successfully mask these imperfections. Not waterproof – Well if it rains, you are most likely screwed. There are makeup products that are waterproof, but only to a certain point. Rubs off – Well sometimes it can rub off easily which can be really frustrating. Touch ups – Regular touch ups during the day are required. Over applied – This is what you would call a disaster. 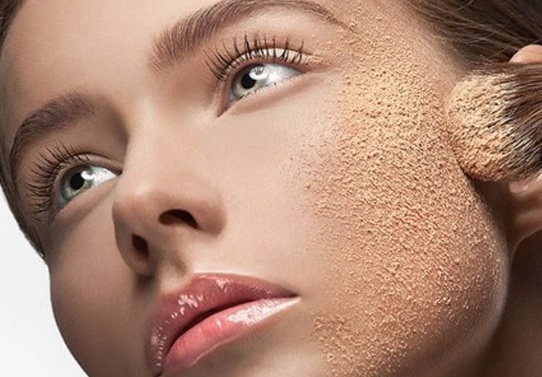 Over application of any makeup leads to your face looking like the surface of a sponge. Tools – Sponges may leave dot patterns on the skin and brushes may leave stroke patterns. Airbrush makeup is a fast-growing trend which promises a flawless finish worthy of a red-carpet event. As the name states, for this application an airbrush gun is needed. It disperses the makeup in the shape of a fine mist onto your face creating a thin, even layer of makeup. This technique offers a completely natural look and successfully covers all skin imperfections. Airbrush makeup kits are offered along with three types of makeup bases: silicon base which is lasts the longest and makes your skin look smoother; water base is suitable for the most sensitive skin types and feels very light on your skin; alcohol base is waterproof, smudge proof and nontransferable, suitable for every day. Flawless finish – The fine mist that is sprayed on your face leaves a flawless finish which is harder to achieve with traditional makeup. Natural look – It will seem that you are not wearing any makeup at all, but you will still look beautiful with perfect skin. Look lasting- Airbrush makeup offers longer lasting with no need for touch ups for up to 24 hours, which is ideal for weddings and other celebrations. Less product needed for total coverage. Waterproof – Airbrush makeup tend to be more resistant to water than traditional makeup. So, if you get emotional, no worries. Hygienic – definitely the cleanest way to apply makeup. No need for potentially bacteria covered sponges, brushes or fingers. Expensive – airbrush makeup and makeup kits tend to be more expensive than traditional makeup. Bad for large pores or wrinkles – Airbrush makeup will not sit on top of them, but sink into the pores and wrinkles. Technique – In order to apply airbrush makeup, you will need to know how to use an airbrush. After reading the article you have some insight into the benefits and drawbacks of both traditional and airbrush makeup. However, the crucial factor in making the decision will be your skin type, the money in your wallet and your personal preferences. There isn’t a wrong decision here, both options lead to you looking fabulous and that is the goal.